Blog Quick Quotes: Want2Scrap Inspiration Week Winner Alert! Want2Scrap Inspiration Week Winner Alert! Denise, please email Rhonda.quickquotes@gmail.com within 7 days to claim your prize. *QQ Prize Disclaimer: Prize contest open to US residents only. If you live outside the US and want to play, you would be responsible for any shipping costs for prizes won. Not a winner this time? No worries!!! 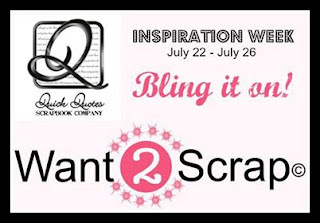 There's still another giveaway with 2 prizes over on the Want2Scrap blog! Check it out here - 3 more days to enter! How fun! Thank you... it was a fun week filled with lots of great projects!